I was working on a project where in i had to convert the DTS packages which copied data from source tables into destination tables (both SQL Server Databases) into SSIS packages. 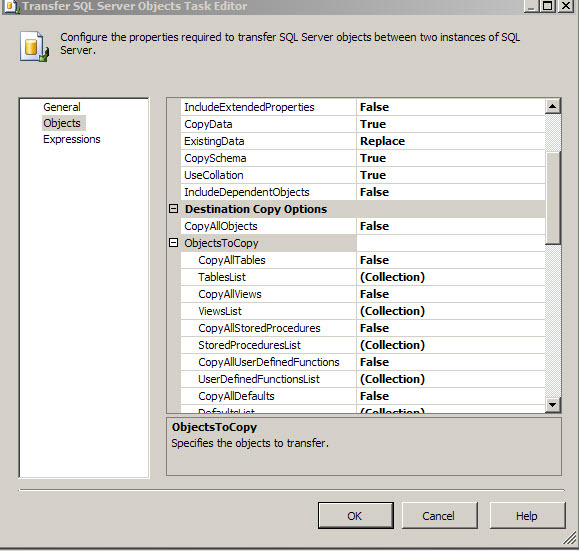 One of the tasks used in the SSIS package was the Transfer SQL Server Objects task. In this task certain tables had to be copied from source Sql Server DB to Destination Database. 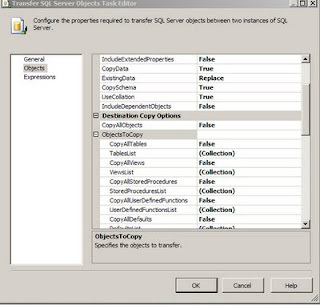 In the Transfer SQL Server Objects task editor (this can be opened by highlighting the task, right click on it and choose the Edit... Option), there is an option called TableList Under the ObjectsToCopy Section which is under the Destination Copy Options ( which is part of the Objects Section). When one clicks on the three dots one can see the table list and the tables that need to be copied can be checked. In case the number of tables is large and in case one wants to find out which tables have been choosen to be copied over, there is easier way to look at the members in the table collection. One has to highlight the Transfer SQL Server Objects task and right click and choose properties. In the list of properties choose the TableList under the Misc Category and click on the three dots, one gets to see the following window which shows the tables that have been selected, for the purpose of confidentiality i have erased the table names in the graphic. I wanted to highlight the use of properties for this task to view the Collection of the tables.